2. Choose the hair,eyes and skin colour. Maximum Image Size for Uploading:600*600px. In case the photo is too large to upload, please skip this step and continue the checkout then send it to sales@bobbles.com.au with your order number. Want a hat? a logo? a pair of glasses? or text on the base? Feel free to write it on your comments. It's all FREE!!!! The posture is fixed and it’s not fully customized item, however the head can be changed. You are allowed to make it with resemblance of your folks, friends, colleague or any significant others. 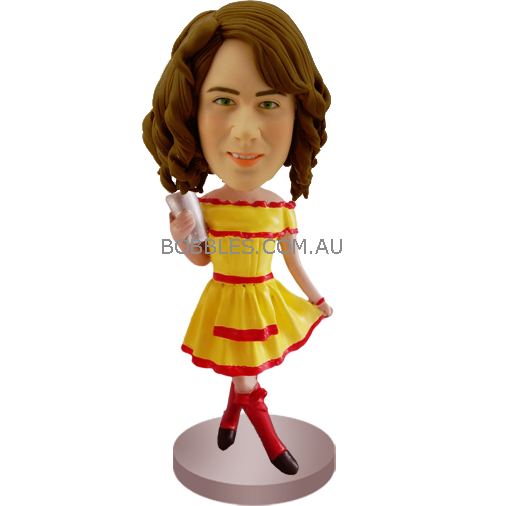 In the birthday, anniversary, Christmas, graduation day, this custom made bobble head will add much fun on the event. Just choose a bobblehead model you like and click the button “Click here to submit photo”, an order will be placed easily in just a few steps. The artists in Bobbles will sculpture your bobble head according to the time scheme you choose and send you the proofs. You will be the judge of the item. We only move to next step and bake the item when your approval is given. So please mind your email inbox and spam box. In any case, the outcome does not meet your expectation. Though it rarely happens, you are allowed to instruct the artist to modify the bobble head till you are 100% satisfied with the finished product. Size of this bobble head is 6.5-7.5 inches (16-18cm). Size will slightly vary from one to the other as all the custom bobbleheads are 100% handmade. Material of this custom bobblehead is Polymer Clay. The color is the clay itself, so bobble heads made in Bobbles are actually more durable, brighter, true 3D likeness, and higher quality than those made from poly resin clay which is the material used by other providers. The most characteristic of Bobbles is it’s one step sculpture service. It’s a premium workmanship by which you can see the complete item at the very first proof. This one step proofing service is only available in Bobbles. On the contrary, the other suppliers offer multi-steps proofing service. It will take at least 4 times to judge the proof. It’s time wasting and inconvenient, because you can not see the whole picture when they only offer you with a face proof. All the products will be well packed in a carton box. If you need us to write a card or a message in the box, we are glad to do this for you. Just feel free to put your instruction during the checkout or send us email. Bobbles customer service representatives are always at your disposal. 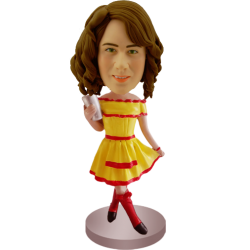 Once your bobble head is done, it would be shipped to you by DHL or Toll which will arrive at your door in merely 2-4 business days. If you have any further questions, please don't hesitate to contact us.